From 2010 until 2014 Arnaud led the Clean Energy team of Piraeus Equity Advisors Clean Energy Fund on sourcing, structuring, executing and managing deals and was also advisor to PJ TechCatalyst due to his prior technology start-up experience. He joined from McKinsey & Co. in London, where he worked as a manager in the energy, renewables and climate change areas. From February 2007 to August 2010 at McKinsey, Mr. Henin served a range of clients on financial due diligence, strategy, and operations projects across Europe and Africa, including leading teams working on renewable investments, market entry strategy, and energy market policy. 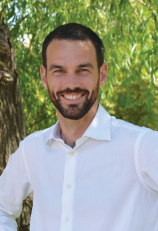 Prior to McKinsey, Arnaud had worked as an engineer and manager with a number of start-ups in the high tech and logistics sectors across Canada including DragonWave, a wireless broadband start-up, Focus Microwaves, an OEM of high frequency test equipment and Fusion, a destination mangement company. Arnaud holds a Bachelor's degree in Electrical Engineering from McGill University in Montreal, Canada and an MBA from Insead, France, with a focus on entrepreneurship.